In 1964 Remco started selling it's series of dolls unofficially know as "Big Head" dolls because of their oversized heads. The dolls were about 5-inches tall with the head taking up 2-inches of the total height. The bodies were plastic and unarticulated. The heads were excellent caricatures of real-life people. They were rubber with real hair. The heads could move from side to side. The Dave Clark Five set is hard to find with all of the members. Only Dave is a true "Big Head", while the other members look more like cake decorations. I've seen a couple of these complete sets go for $200-$300. 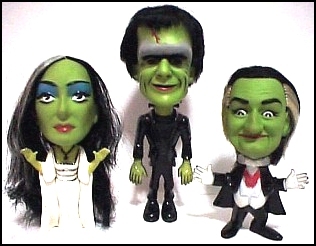 The Munsters and The Addams Family are very popular with collectors and beautiful representations of the TV characters. These darlings of Monster fans can sell for as much as $250 for a single boxed figure. There are two political dolls in the series, President Lyndon B. Johnson and Senator Barry Goldwater. Both of these dolls have molded hair. For some reason they are not as popular as the pop-culture figures and you can easily pick up these guys in their original boxes for $25 and less. There are two western-flavored figures in the "Big Heads" line: Fess Parker as Daniel Boone and the Cowboy Pete Wagon playset. The Parker is a tough find with all of his accessories but can still be had for under $75. The Cowboy Pete figures (molded hair and Best of the West type articulation) and playset may be the hardest to collect of all the figures. Pete and the other two figures occasionally show up on auction and sales sites but rarely under the right name making searching for them electronically very difficult. There were also a lot of accessories with the playset making it extremely hard to complete. Lastly, there's the lone military figure from 1965 - Li'l Soldier Joe and the Ack-Ack Jeep set. The figure and jeep were accompanied by a tan accessories. In 1967, Hasbro released a similar line of character dolls called Show Biz Babies. These dolls were shorter but had the same type of faces, hair and head to body ratio.